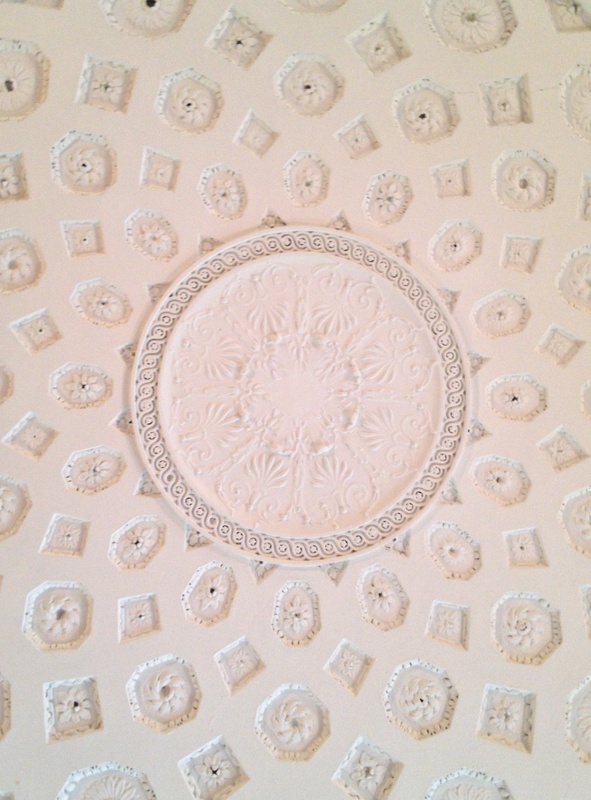 This entry was posted in Architectural History, Country House, Dublin, Irish Castle and tagged Dublin, Georgian Architecture, Historic Interiors, Interior Decoration, Irish Castle, Rathfarnham Castle, Stately Home, The Big House. 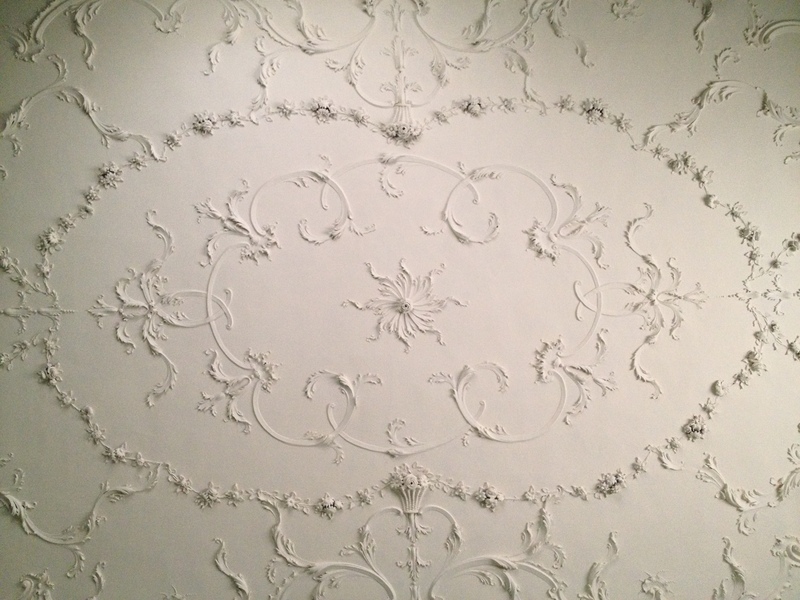 As Managers of Rathfarnham Castle we are delighted that the Irish Aesthete has shared this excellent write up on the owners of the Castle over the centuries with your readers. Please be reassured we continue to do all we can to engage audiences to come and experience the extraordinary craftsmanship to be experienced at the Castle. I moved the Castle to opening all year since 2011 and we have seen visitor numbers increase from an annual figure of 6,000 to now approx. 22,000 per annum to the Castle alone with additional visitors to the Café and grounds. 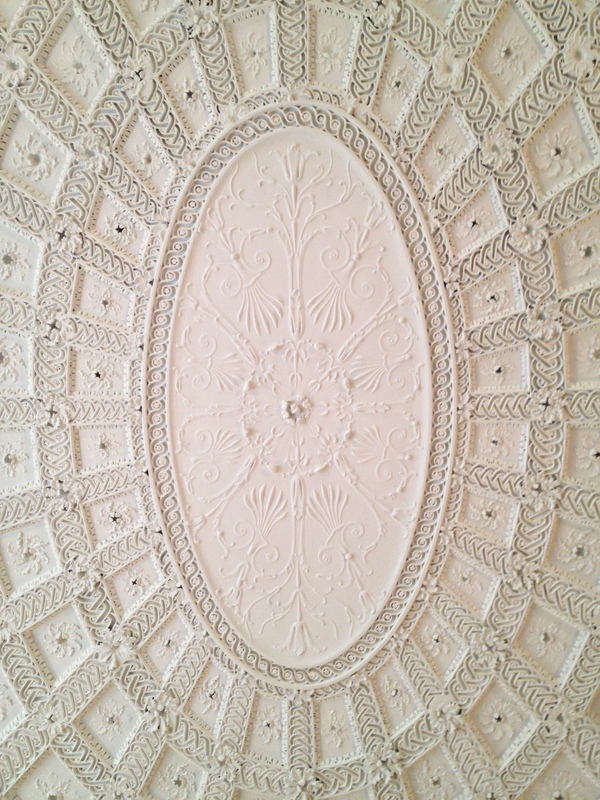 I am also really proud of getting a number of the smaller rooms of which you have shown pictures of the plasterwork ceilings open for the first time to visitors since my team started working there in 2009. You will be aware the IGS Traditional Building Skills weekend was held at Rathfarnham Castle this year and we used this opportunity to gatet large numbers in to experience the craftsmanship in the Castle. 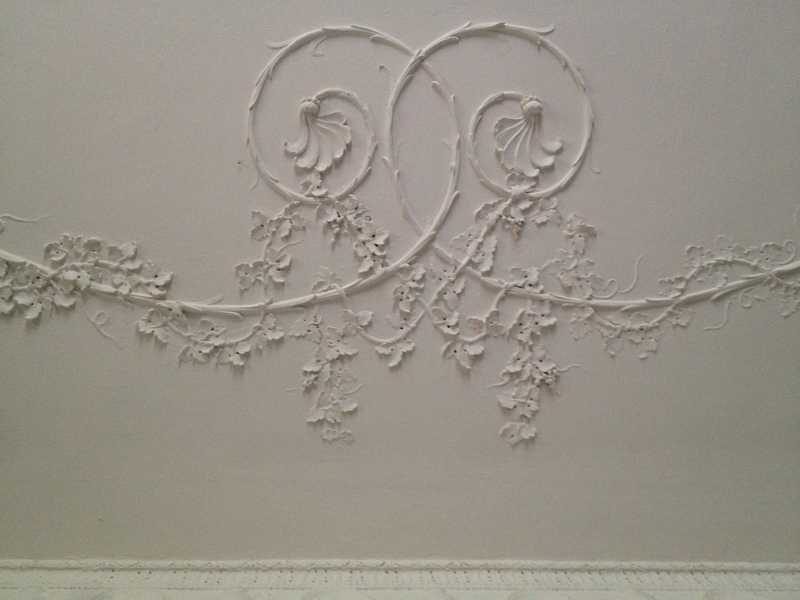 What have you in mind in terms of bringing out the significance of the plasterwork more. 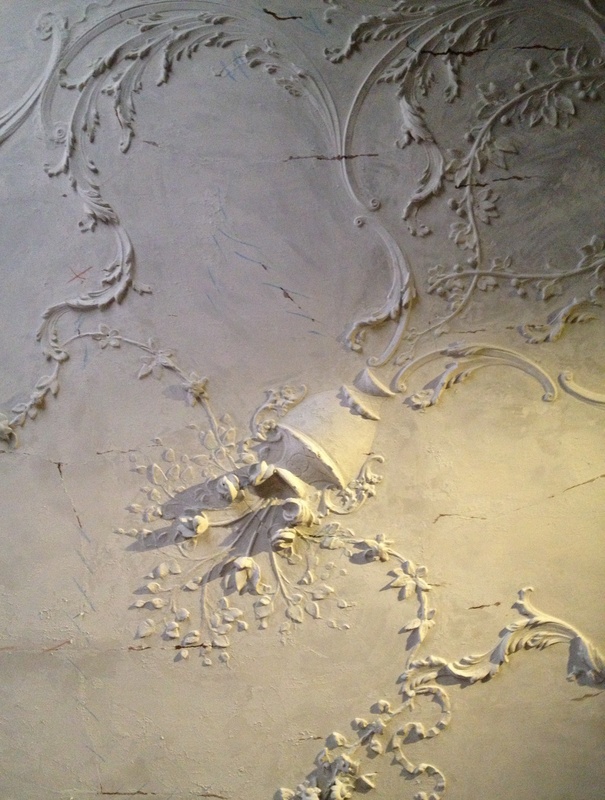 Specific plasterwork tours. It is certainly worth exploring more. I have to put in a word of defence for Farmleigh – I don’t think it can be compared to works carried out at Powerscourt and Carton. 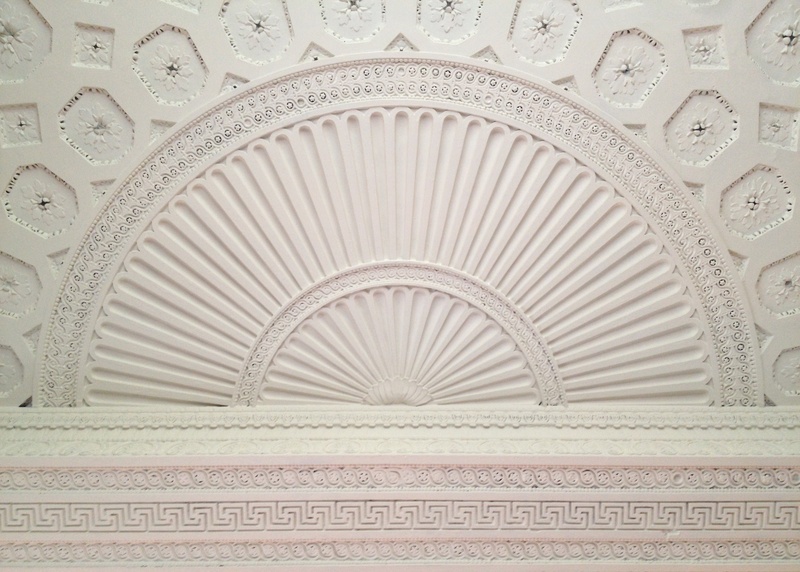 Farmleigh House, Gardens and Grounds have been conserved with a huge emphasis on the presentation of the home of the late Victorian/early Edwardian owner Sir Edward Cecil and Adelaide Guinness, First Earl and Countess of Iveagh. The State has presented the interiors very carefully with the Dining Room a completely intact 1880’s interior with all of its original contents in place. The Library likewise is a wonderful double height late 19th c. interior with what is probably the finest book collection of bindings in Ireland. The gardens created by Adelaide and successive Countesses of Iveagh in particular the late Miranda Guinness continue to be maintained according to their original schemes. With no commercial aspects to the Estate, save the Café, and visitor numbers of 350,000 annually I would argue that Farmleigh has contributed in no small way to visitors getting an appreciation of our built heritage including gardens in a friendly way. We are working all the time to increase access and raise education about the incredible inheritances we have a duty to care for and hand on to those coming after us. If you haven’t been there for a while please come back and take in the beauty of the House and gardens. I can get the exact details, but the building was sold by the family to a Dublin building contractor, and it was them who sold the land to the golf club, as well as the Chambers staircase and the original fireplaces, before selling on to the Jesuits. Wonderful photos, you have a gift. Thank you for your observations. It had been my belief that the Blackburnes sold Rathfarnham directly to the Order of Jesus but if there was another owner between these two and I have therefore maligned the Jesuits I happily apologise. If you can find that additional information and forward to me I would be most grateful. I did explore the fascinating basement but not, on my most recent visit, the roof: for another time. Thank you for compliment about the pictures, amazing what can be done with an iPhone. The Castle was indeed sold to contractors by the Blackburnes – it isn’t really certain who was responsible for removing the grand staircase nor when it was removed, but it was certainly gone by the time the Society of Jesus purchased the Castle. Hi Robert. I can’t find a written reference, however last year Archaeologist Alan Hayden worked in the castle, and he said a firm of builders called Bailey and Gibson bought the castle and sold the Chamber’s staircase and fireplaces to a company in London whereafter they disappeared. The Jesuits replaced the fireplaces with comparable examples. The vaulting for this fireplace is still in the basement of the flanking tower, and Alan’s survey of the building showed that this towers geometry does not match the other 3, and does not line up with the musket loops, which he ascribes to this being the location of the Eustace castle. He also showed me the likely location of the medieval staircase. I will try to check citations with him, the OPW may have exact references. Sorry I can’t be more precise. Thank you for this, most helpful. I will have a word with the relevant people in the OPW and see if I can find out anything further, but this is an excellent start, so I am very grateful. Perhaps there is a history of Castle Golf Club out there, i will have a look. 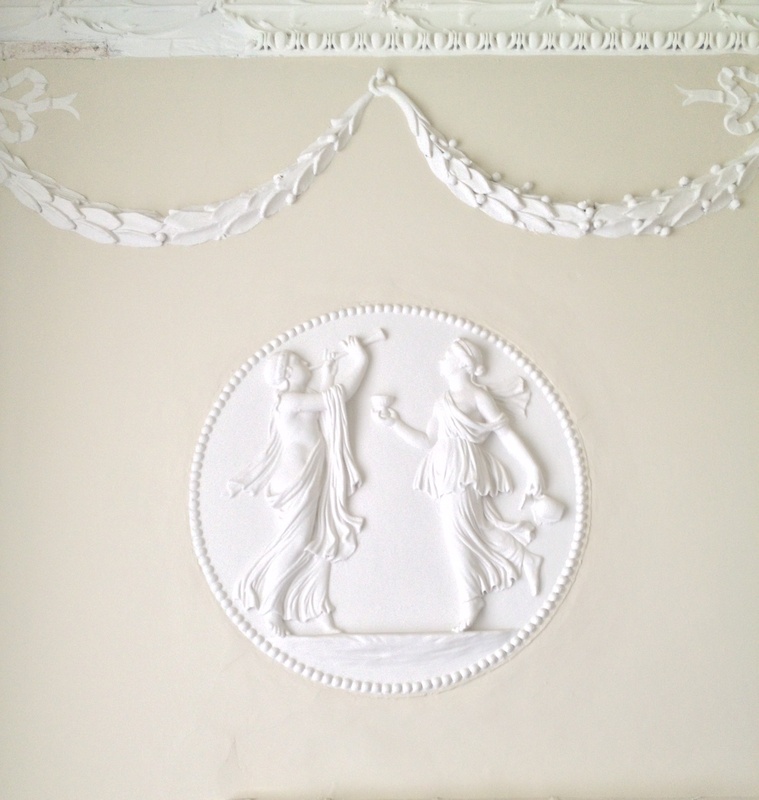 Wonderful photographs of the plasterwork Robert. With regard to making more of that aspect of the building, patience and a lot more research is required before a more detailed presentation can be made. For instance the fact that Edward Worth, cousin of Dr. Edward Worth lived there for at least 30 years has rarely been noted. 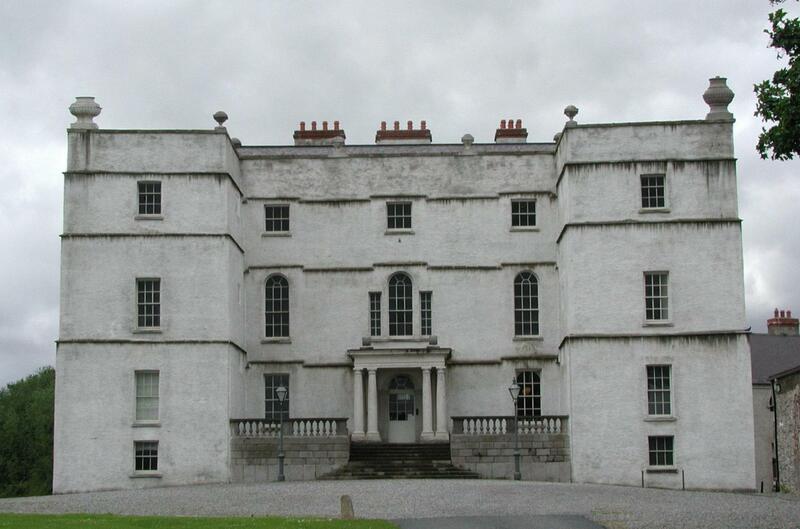 Is it not likely that he would have made more alterations and ‘improvements’ to the building than Archbishop Hoadly who lived only 4 years after his purchase of Rathfarnham in 1742. Thanks for you comments. Of course you are right, I am sure that Hoadly, who only bought Rathfarnham in old age and then died a few years later, probably made little intervention to the structure – and likewise his son-in-law who had other distractions (and debts). 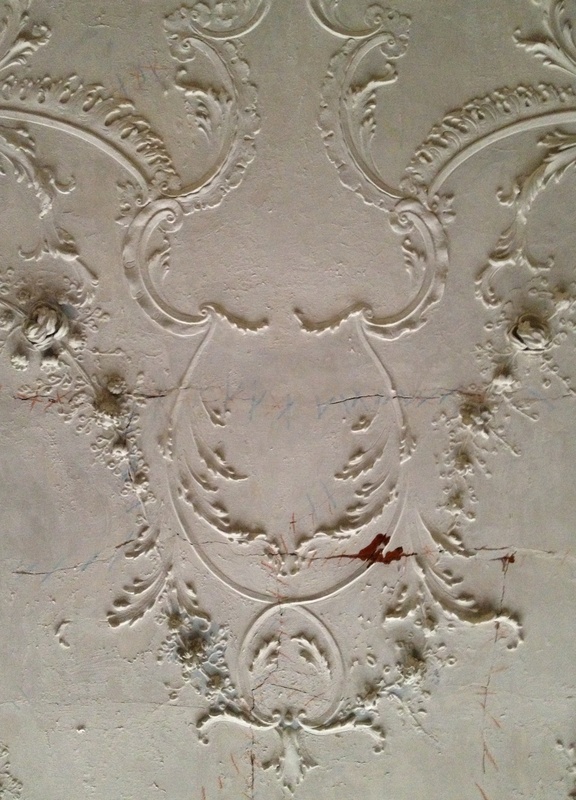 There is more research to be done, but in the meantime it would still be worthwhile drawing visitors’ attention to the fascinating wealth of plasterwork in the house and the variety of styles therein. I feel at the moment that this resource, and tribute to Irish craftsmanship, is being insufficiently celebrated, and that must be regretted. I really enjoyed reading this article, thanks for writing so much about it (and do hope there is more). 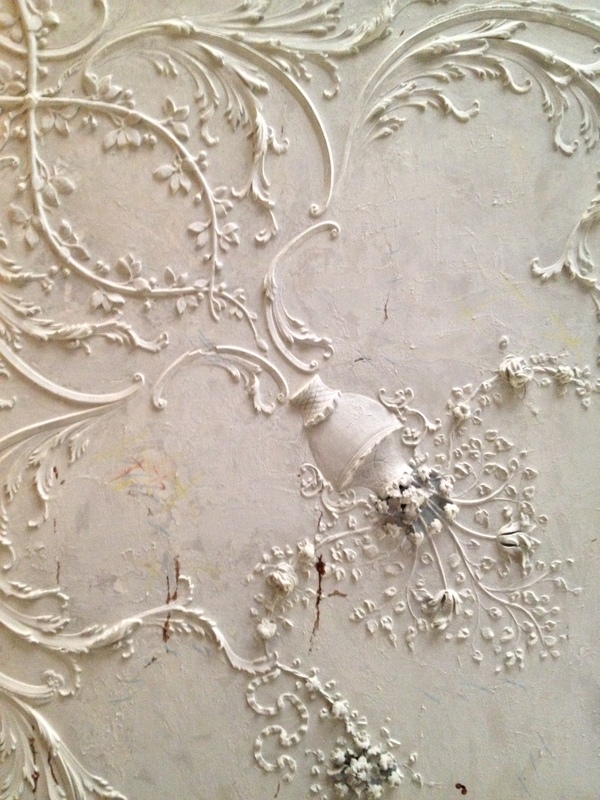 It’s interesting that the whole article can be illustrated by just plasterwork photos. Had a great time visiting there and the staff were very informative – they gave a great overview of the place while we were at the model in the stairwell. The door opposite the entrance has an unusual window over it – it funnels upwards if I remember correctly. Would there have been a mirror there originally, or what is the idea behind that design? Thanks for yours. Yes, the staff are very good and keen to communicate with visitors, which is wonderful. I can’t remember the door opposite the entrance and fear I didn’t take a picture of it, so can’t answer your query right now. Let me check and if I can I will revert to you. The door opposite the Entrance Hall has a mirror over it – the mirror is tilted at an angle and this allowed the servant charged with opening the door to keep an eye out for approaching carriages/guests as no servant would have been allowed to be seen looking out the window. Thank you for this information. Most interesting. 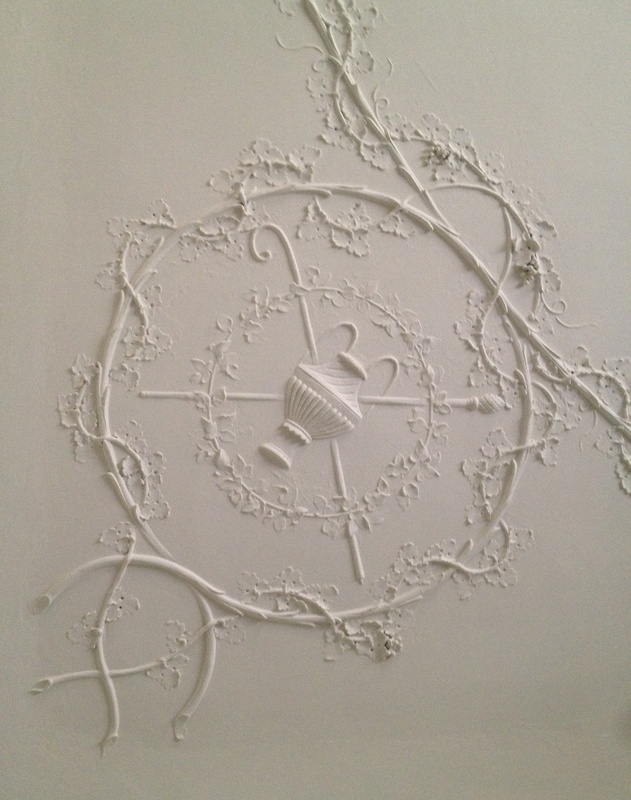 If you see just after you Mairtin d’Alton provides some information about builders owning Rathfarnham Castle between the Blackburnes and the Jesuits, during which time, he explains, both the staircase and the original chimneypieces were removed. Thanks for that information – that’s really fantastic to know! Thank you for getting in touch and for your kind remark. Likewise, please don’t stop reading what is here! Robert, would you like to visit Rathfarnham during August while the archaeologist are working there? I was interested to read the comments about Rathfarnham’s sale to a firm of builders who stripped out and sold the fireplaces, because I have in my house in England a fireplace that my grandfather bought, which certainly came from Ireland and was said to have come from a house in Merrion Square, but which seems to be the fine surviving twin of a somewhat mutilated Bossi fireplace that is still at Rathfarnham. So maybe it was one of those sold to dealers in London. I have been delighted to read your beautifully illustrated article about the Castle, and at the risk of sounding opportunistic, should like to draw your readers’ attention to my recent book – The Invention of Memory, An Irish Family Scrapbook 1560-1934 (Daunt Books) – an extended meditation on my family history which also includes a great deal about Rathfarnham. A paperback edition is due out in June. Thank you for getting in touch. Indeed I am familiar with your book, which I would likewise very much recommend to readers: I am giving a talk next Friday on Ireland’s Building Bishops which begins with a discussion of your forebear Adam Loftus. The chimneypiece you mention does sound most interesting and if you wished to send me privately a photograph I would be delighted to see it: the stripping of Rathfarnham a century ago, including the loss of its main staircase, was a great loss to the building.